Boots & Brew Ticket Supplies Are Limited! 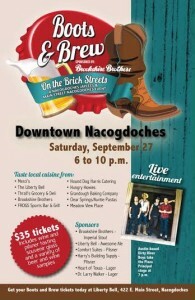 Nacogdoches, Texas – The Nacogdoches Jaycees and Nacogdoches Main Street are excited to announce that tickets for the 1st annual Boots & Brew event presented by Brookshire Brothers are on sale at the Liberty Bell, 422 E. Main Street, in historic downtown Nacogdoches “Ticket sales have been going extremely well” said Main Street Director Sarah O’Brien. Slated for Saturday, September 27th, 2014 from 6 to 10 p.m. the inaugural Boots & Brew event will be located on the downtown square. You can purchase tickets using cash, check or credit card, however organizers encourage cash and check so that event proceeds can be used for downtown beautification and to support the youth of Nacogdoches County. The Liberty Bell will have tickets available for purchase Tuesday-Saturday from 11 a.m. to midnight. Boots & Brew will feature live entertainment by the Dirty River Boys, an Austin based band who are described as a little bit western and a little bit rock and roll. The Dirty River Boys have performed in Nacogdoches at Banita Creek Hall and are excited to return again. They will take the Plaza Principal stage at 7 p.m. Ticket prices include both a wine and pilsner tasting souvenir glass. Attendees will have the opportunity to enjoy a variety of both beer and wine samples and chat with experts including, Brew Master Collin Klingemann from the St. Arnold’s Brewery in Houston. “We are excited about the variety of samples that will be provided to our attendees,” said Jaycees President Paul Smith, “there will really be something for everyone.” Attendees are also encouraged to utilize Driving Jacks who will be onsite at our event to provide safe rides home for attendees. Special thanks goes out to our local restaurants for providing a variety of delicious food samples for attendees: Merci’s World Cuisine, The Liberty Bell, Thrall’s Grocery & Deli, Brookshire Brothers, FROGS Sports Bar & Grill, Hound Dog Harris Catering, Hungry Howies, Grandough Baking Company, Clear Springs/Auntie Pasta’s and Meadowview place. “We encourage our attendees to bring their boots and their appetites,” said Smith. Different than the Nacogdoches Main Street Downtown Wine Swirl, Boots & Brew will be held on the downtown square and will feature a variety of vendors, including downtown merchants Rhinestone Rifles and Blue Sparrow as well as favorites like M&S Pharmacy, It’s A Cowgirl Thing, and Boot Barn just to name a few. Rumor has it Boots & Brew ticket holders will have the opportunity to visit and purchase tickets to the Big Nac Music Festival which will hit the red brick streets in March 2015. Boots and Brew is produced by the City of Nacogdoches Main Street Program and the Nacogdoches Jaycees. Special thanks to our sponsors Brookshire Brothers, the Liberty Bell, Heart of Texas Gift Gallery, Dr. Larry Walker, Comfort Suites and Harry’s Building Supply for making this event possible. You can “Like” Boots and Brew on facebook or contact the Nacogdoches Main Street Office at 936-559-2573 for more information or via email at obriens@ci.nacogdoches.tx.us. 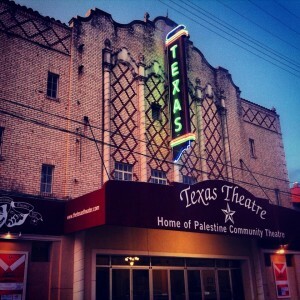 Coming Up Soon at Liberty Hall TYLER– There is not a bad seat in the house! Only 315 to choose from. Liberty Hall is a very intimate setting for live music, theater, comedy and movies. This June, Liberty Hall has dedicated the screen to your favorite wedding flicks.